An intimate ceremony provided a beautiful start to married life for Preston couple Peter Ferguson and Laura Sumner. Peter’s dad, Richard Ferguson is a retired vicar and was able to conduct the ceremony, as he did at the weddings of his other children, at St John’s Baptist Church in Broughton. The couple met through mutual friend who had wanted to set them up for a while. Love blossomed and Pete proposed on a jetty on holiday in Alcudia, two years ago in Majorca. Their wedding day dawned on a hot summers day as guest gathered at the church for the ceremony. Afterwards celebrations continued at Beeston Manor where the couple made the most of the beautiful grounds with arden games, an outdoor hog roast in the evening and sparklers at sunset. 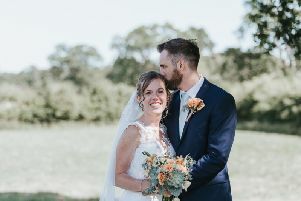 As their wedding was in the middle of a heatwave, they had an ice-cream trike instead of traditional canapes as the couple love mint choc chip ice-cream. Peter, a fitness trainer who is originally from North Sheilds said: “The awesome weather and our wedding not clashing with the England quarter final world cup match made the day even better, we were very lucky! They danced their first dance to Al Green’s Let’s Stay together, played by the band Funtime Frankies. “We were so lucky,” said Peter, “we couldn’t have asked for a better day. Having my dad taking the ceremony made it even more personal and special. 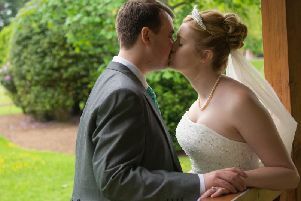 Laura, an office manager, added: “It was an amazing day that we’ll cherish forever. “We’re so glad we could share it with so many family and friends.